Do you ever feel you don't have enough energy to do things?? Weather it is around the house or if you are going to the gym or if you are going out to play sports and you just don't have the energy to do it go out and buy you some EBOOST they have many different flavors such as natural orange, pink lemonade, acai pomegranate, orange shot, super berry shot, and coconut water. The kind I was able to try was the super berry and it tastes pretty good. Feeling “up” is not the same as feeling good. Sure, you can swallow a chemical concoction or chug some sugar water for a momentary burst. But what goes up must come down. That’s why EBOOST’s blend of vitamins, minerals, and super-nutrients works from within to give you a natural lift. It’s packed with ingredients like Vitamins C, D, B6, B12, as well as 5-HTP, Resveratrol, Green Tea, and Green Coffee. Just add water to our effervescent powder, or grab our premium shot on the go. 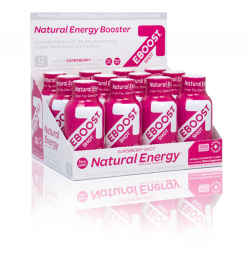 EBOOST’s natural energy is designed to boost your workout, and your life.